Filmed before a live audience November 29, 1965. Prerelease title: This Could Be the Night. Follow-up to THE T.A.M.I. SHOW casts a wider musical net, with lesser results, but Diddley, Tina Turner, and Ronnie Spector keep it pumping. Shot on tape, transferred to film; footage reused in THAT WAS ROCK. Filmed at The Moulin Rouge club in Los Angeles, sometime in 1966. 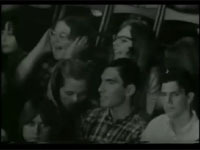 Besides the TV episode in video form, there is also reported a two minute B&W promo reel which shows FZ in the crowd. 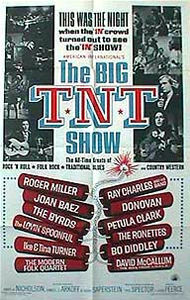 I watched the "Big TNT Show" on AMC the other night and Joan Baez, Pet Clark and even Donovan were pretty much slow points in an otherwise great rock flick. As for the screaming teenagers, some of the screaming and laughter seems to be rather forced. At one point, the Lovin' Spoonful make a false start on "Do You Believe In Magic?" and the girls they show start laughing louder when the camera hits them. On the other hand, you do get to see some people showing their boredom, some little kid plugging his ears, an elderly couple wondering "why are we here" and teenage boys getting annoyed at the overzealousness of girls behind them. Visible in the audience are apparently several current and future rock personalities, including Sky Saxon of the Seeds, Frank Zappa, and the two brothers who formed Sparks in the '80s. Phil Spector makes a cameo as piano player for Joan Baez's execrable version of "You've Lost That Lovin' Feeling." I think the night belonged to the R&B acts on the bill . . . Ray Charles, the Ronettes and Ike and Tina, although the Lovin' Spoonful put on a good show and Roger Miller was pretty entertaining, despite being a novelty act, the oddity in the mix. You'd expect the Byrds to be the big highlight, but they looked pretty bored . . . But the sound was pretty good and the picture quality excellent, although there were some bad splices and skips in it from time to time. And just who was/is David McCallum? All I could think of when I looked at and heard him was David Hyde Pierce's character on "Frasier." However, the girls seemed to find him appealing even when he was "conducting" that horrible big band version of "Satisfaction." Maybe it was all coached. Now if they'd show the entire "T.A.M.I Show," complete with the Barbarians doing "Hey Little Bird" . . .
David McCallum played Ilya Kuryakin in the "Man from U.N.C.L.E." TV series. Come to think of it, he did look an awful lot like Niles Crane! 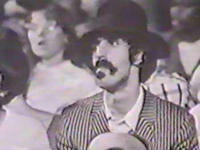 A close-up of FZ in the audience appears in the trailer, right after Joan Baez. A wide shot of the audience wherein FZ can be seen whispering in the ear to his left neighbour appears at 22:15 and again at 41:51 in the movie, and then again, right before FZ's whispering, at 83:41 (thanks to Javier Al Fresco for spotting it!). 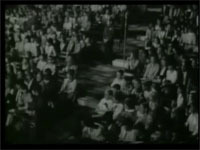 A close-up of the Mael brothers (the future Sparks) can be seen at 4:39 in the film. This is a compilation which includes parts of the T.N.T. Show and its predecessor, the T.A.M.I. Show, but it's not clear if FZ actually appears in it. The American TAMI rock and pop concert of 1965, directed by Steve Binder, and the 1966 TNT concert directed by Larry Peerce, have long been held as sensational remembrances of the greatest era of rock and pop. Here, side by side, were the Beach Boys and the Rolling Stones, the Ronettes and the Supremes, Tina Turner, Bo Diddley, even Donovan—the list runs on. The filmed TAMI concert ran for 123 minutes; the TNT show for 93 minutes. Priceless stuff. But this DVD gives us, instead of those complete shows, an anthology of only 90 minutes, drawn at random order from both shows, omitting way more than half the material. This compilation appears to have been presented on video in the 1980s, and it splices in between the concert footage some cheesy, embarrasingly bad and totally unecessary introductions for each act from Chuck Berry. On Wednesday July 5th (2000) at 6AM and you can see the clip on "Hollywood Rocks the Movies: The Early Years" the AMC documentary. I just saw him in the audience at the Phil Spector project "the TNT show". Set your VCR's. I just got done watching the that too. 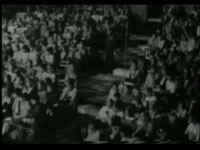 It is a compilation of clips from R&R movies up to about 1970 with Ringo Starr as the narrator. This program showed FZ for about two seconds from the TNT Show movie. The TNT Show itself is scheduled for July 4th morning. The Hollywood Rock and Roll: The Early Years, flick is scheduled to be rebroadcast twice on Monday night too.